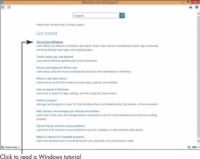 If you need a basic tutorial on how to use Windows 8.1, consider using the Getting Started section of the Windows website. Here you can find videos, blogs, and articles to help you get started. Press the Windows key to display the Start screen. 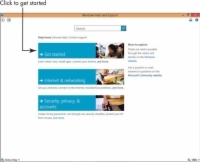 1Begin to type help from the Start screen. Click Help and Support in the results to display it. 2Click the Get Started link. 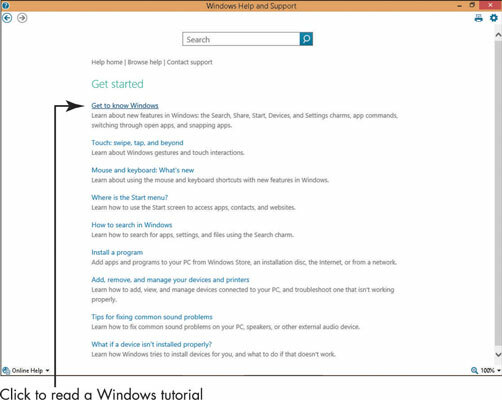 3Click the Get to Know Windows link to read the introductory tutorial. Another way to get to some of these options is to simply go to Microsoft.com and select from the choices presented there. Don’t forget that you can reduce the size of the Help and Support windows by clicking the Restore Down button in the upper right corner, immediately to the left of the Close button labeled X. This is helpful because you can display the help information alongside Windows settings to help you troubleshoot the topic with Help displayed. 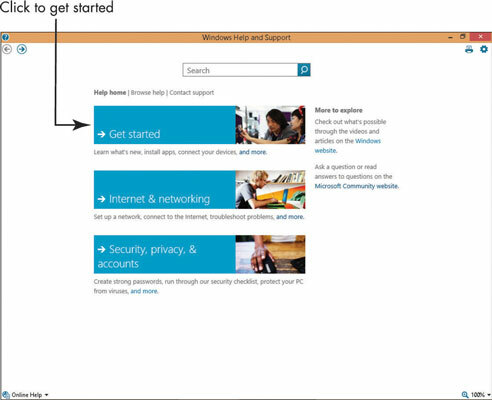 When you first arrive at the Get Started page, take a moment to explore other links to read blogs or get more information on specific issues such as How to Search in Windows 8.1 and Touch: Swipe, Tap, and Beyond.